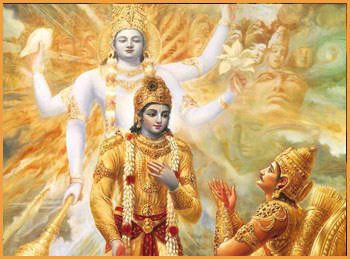 Gita Jayanti is the day when Lord Krishna enlightened Arjuna with the holy teaching of Bhagavad Gita. Through extraordinary divine dialogue Lord Krishna explained to confused and dejected Arjuna the meaning of Karma Yoga and how he can attain the purpose of life by performing his prescribed duty and following his Dharma (Righteousness). 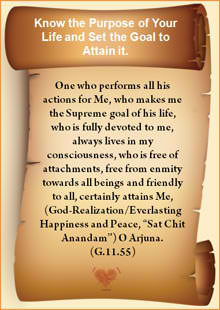 He uplifted Arjuna from his confused and dejected state of mind (Lower-self) into his Self-realized state (Higher-Self) through a step-by-step spiritual journey.Gita Jayanti comes every year to remind us that we all are all Arjuna of today and, like him, we can also use LORD KRISHNA’s advice and apply it in our life to remove our confusions, uplift our selves and live in peace and Anandam.The following messages are taken from the divine dialogue of the Gita.